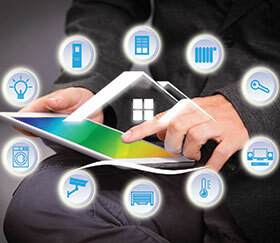 The DSC iotega WS900x wireless home automation panel intelligently activates homes and businesses, based on events, schedules and other triggers. The platform offers control of lights, thermostats, power sockets, door locks and other home automation devices. Data on the system is fully secure with end-to-end 128-bit AES encryption. With multi-channel Frequency Hopping Spread Spectrum technology, which overcomes frequency blocking and interference, TDMA synchronised communication for preventing messaging collisions, and high transmission ranges, PowerG enables reliable communication up to 2 km line-of-sight. Adaptive transmission power preserves battery life. The device has a smooth-touch keypad for the main security functions and a proximity sensor illuminates the keypad with a simple hand gesture. Control the system from the Smartlink application as a further option. The system supports multiple communications protocols, such as Ethernet, as well as a wide range of wireless options such as Wi-Fi, Z-Wave Plus, PowerG and optional cellular (3G).